"U.S. Marine Prototype" Rolex, Oyster Perpetual Date, U.S. Marine, Superlative Chronometer, Officially Certified, Ref. 1690, movement No. 024510. Prototype made in two examples in 1982, for the US. Marines, production was never undertaken. Exceptionally rare and very fine, asymmetrical, center-seconds, self-winding, water-resistant, stainless steel military wristwatch with U.S. Marine logo in red, and a stainless steel extendable Oyster bracelet. C. three-body, massive, polished and brushed, screwed-down case back and crown, 12-hour graduated revolving steel bezel, protected by the hooded lugs, "Triplock" winding-crown at 4 o?clock protected by a "Crown Guard", domed crystal, elongated lugs with detachable hoods, the screw-down back engraved "U.S. Marine", and twice engraved with the Rolex crown.D. black with tritium-coated round and triangular indexes outer red Arabic five minutes, aperture for the date, "U.S. Marine" in red writing. Tritium-coated steel "Skeleton" hands.M. Cal. 1570, rhodium-plated, "oeil-deperdrix" decoration, 26 jewels, straight line lever escapement, monometallic balance adjusted to temperatures and 5 positions, shock-absorber, self-compensating free-sprung Breguet balance-spring, Microstella regulating screws. Dial, case and movement signed.Dim. 58 X 44 mm. C. three-body, massive, polished and brushed, screwed-down case back and crown, 12-hour graduated revolving steel bezel, protected by the hooded lugs, "Triplock" winding-crown at 4 oclock protected by a "Crown Guard", domed crystal, elongated lugs with detachable hoods, the screw-down back engraved "U.S. Marine", and twice engraved with the Rolex crown. D. black with tritium-coated round and triangular indexes outer red Arabic five minutes, aperture for the date, "U.S. Marine" in red writing. Tritium-coated steel "Skeleton" hands. M. Cal. 1570, rhodium-plated, "oeil-deperdrix" decoration, 26 jewels, straight line lever escapement, monometallic balance adjusted to temperatures and 5 positions, shock-absorber, self-compensating free-sprung Breguet balance-spring, Microstella regulating screws. Dial, case and movement signed.Dim. 58 X 44 mm. 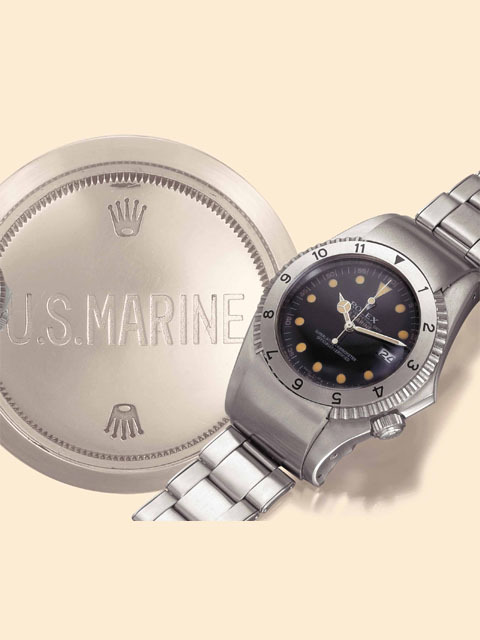 This is the first watch known to be sold at auction, with dial marked "U.S.Marine". The case of this watch is perfectly engineered for heavy military use. Its large size ensures that the wrist will be completely covered, thereby preventing the injuries sometimes caused by violent impacts to smaller watches, the winding crown positioned at 4 o?clock, with its sloping crown guard, affords better protection than the standard configuration of crown and guard at 3. The rounded hoods covering the lugs reduce the possibility of the watch?s becoming caught in equipment and also act as locks for the bezel. The steel rotating 12-hour bezel effectively gives an hour and minute recorder which is invaluable in military excercises. Overall, this watch was designed for only one purpose, to tell time in some of the harshest environments and under the most extreme conditions, the types of activity that are synonymous with the U.S. Marine Corps. According to unofficial information from Rolex, two similar prototypes by Tudor were offered to the U.S. Navy. One of these Tudor prototypes w s sold by Antiquorum NY in May 1998, lot 36. The present watch will be illustrated in the upcoming book on Rolex, soon to be published by Guido Mondani.